You have a lot of important decisions to make before building your spa enclosure. This list of tips and ideas is designed to make those decisions a bit easier. Perhaps the best advice we can give is to contact us at any time. We go through this process daily and have the answers to your questions. Get our designers involved now and you’ll be glad later. Where Do You Want to Build Your Spa Enclosure? Enclosure Location – Choosing a site for a spa enclosure often becomes a balancing act between utility and aesthetics. Do you want a bright spot with loads of sunlight and a broad view? Or do you prefer a shady nook, private, and away from neighbours’ eyes? Do you want to be right beside the pool for easy dips between the two? And will you want to stay close to the house to minimize the chill on the way back inside after a good soak? If you intend to use your hot tub in all seasons, how easy will it be to access? Consider, also, what it will look like at different times of the year. A spot in the shade may be exposed in the winter but, for many people, the extra light this provides is welcome. Remember you’ll need easy access to the hot tub pump and plumbing connections so consider this in the layout. Now’s also the time consider ventilation and electricity. Think about the size too. It needs to be big enough to fit your hot tub, of course, but what else do you envision there? A fridge for snacks and drinks? A table and chairs? Some cupboards for storage? Some people also like to build a sauna in their spa enclosure. Before you decide on a size, it’s wise to make a list of the many uses you anticipate. The, once you think you have the ideal size in your mind, measure it out physically on your chosen site with stakes and string. Walk around inside and out. Will all the objects and people you intend to house within it fit comfortably? How well does its size blend in with your property? At this stage you may wish to rebalance the aesthetics and utility decisions. But the only wrong decision is one that you didn’t consider ahead of time. Zoning requirements - In most municipalities, a structure under 100 sq ft doesn’t need a building permit. However, there may be other bi-laws, like setbacks from your property line, etc… It pays to find out ahead of time, so check with your local government office. We offer help with this process as well. Learn more about permits and zoning. Grade – It’s best to choose a level site with a slight pitch at the back. This promotes easy drainage. You can build your hot tub enclosure on a steeper slope but you’ll want to give plenty of consideration to the foundation. It’s best to avoid building at the foot of a hill but if you do, be sure you have excellent drainage. Summerwood spa enclosures are available in a wide variety of styles and you have loads of options to customize it and make it your own. Have a look at our photo gallery to learn the experiences of others who’ve had to make many of the same decisions you’re grappling with now. Our Custom Design Center allows you to truly customize your spa enclosure and see what it looks like in real time. Add thermal doors and windows, change the size and view the many other options available to you. Not everyone wants their hot tub enclosure to harmonize with their property. Sometimes a clash is welcome. The important thing is that you plan the final effect now. A trellis with vines, some shrubs and flowers can add character to the space surrounding your spa enclosure. Think big picture first. Are you building into an existing deck? Will you want an interconnected flagstone path to the door? Can you build on a rise and produce a view? Then think about the details. Sometimes an old chair or some wind chimes can add just the right accent. How Big Should Your Enclosure Be? While you don’t want your spa enclosure to visually overpower everything else on your property, you still want it to be big enough to perform its many functions. For instance, are you installing a hot tub and a sauna? If so you may also want an outdoor shower. (We offer these as well!) Make sure you have some place between the tub and the wall for the insulated cover. You don’t want to have to struggle to get it on and off. Again, it makes sense to list all the elements you envision your hot tub enclosure containing. Make that list and check it twice! When it’s complete, choose the size of your structure, leaving enough room for however many people you’ll be hosting in it. Next, take some stakes and string then physically outline the site you’re considering. Move around inside and out of it. Will there be enough room? Will it overpower the surrounding area? This is the time to size up or down, depending on the answers to these questions. At Summerwood, we refuse to use any but the finest materials in our kits. Building with quality materials ensures a longer life for your spa enclosure. Most of our products are constructed from a premium grade of western red cedar or Canexel maintenance free wood fiber siding (available in many vibrant colors). Different materials create different looks so you may want to consider that if you want your design to extend or complement the architectural style of your house and other structures on your property. Click for detailed information on our materials and siding. Our Coventry spa enclosures come standard with cedar studs, rafters, and roof boards as well as 12″ of extra overhang and vertical siding. Some people look upon our building kits as a fun, family project that they can put up over a weekend. If you’re skilled you can do it in hours. Each kit comes with a breakdown of estimated (a lot has to do with how fast you are, and your level of experience), work hours needed to complete the tasks. You’ll find them handy for planning. They also make it easy for a contractor to give you an estimate if you choose that route. This how to hire a contractor package is very useful too. All the tools and information you’ll need to assemble your hot tub gazebo can be found here. Plus, if you ever have any questions, you can email or call us and we’ll help you right then and there. Style is a personal issue. That’s why at Summerwood we offer choices. Remember all our spa enclosure styles can be customized to your personal requirements and tastes. Our enclosure kits range in size from as small as you want to as big as you want. Browse through the below styles and find your perfect Spa oasis! And don’t forget we’re here to help at any point along the way. Sonoma Spa Enclosures – Inspired by California’s wine country, the Sonoma line of spa & hot tub enclosures feature design details such as a low hip style roof, thermal doors and windows and many other options. Add your own personal touch in our online Custom Design Center. San Cristobal Spa Enclosures – The San Cristobal spa enclosure kit creates an elegant structure worthy of the finest resorts. Surround yourself with nature but keep its blasts at bay with gorgeous French doors and entire walls of windows. Santa Cruz Spa Enclosures – Go California dreamin’ in the Santa Cruz spa enclosure. Its architectural windows allow loads of light in, so you can enjoy nature’s constantly changing tableau and, at the same time, keep the cool breeze out. Melbourne Spa Enclosures - Our Melbourne Tudor style spa enclosure is a favorite of our professional pool and landscape clientele. The charm and splendor of its design provides a striking and original poolside look. Your guests and neighbors will be asking a lot of interesting questions. Champlain Spa Enclosures - The Windsor is perhaps the most striking cabana we offer. Its’ regal look makes it a favorite for those who want to entertain in style. Used as a spa enclosure, this stylish building will delight family and friends for years to come. 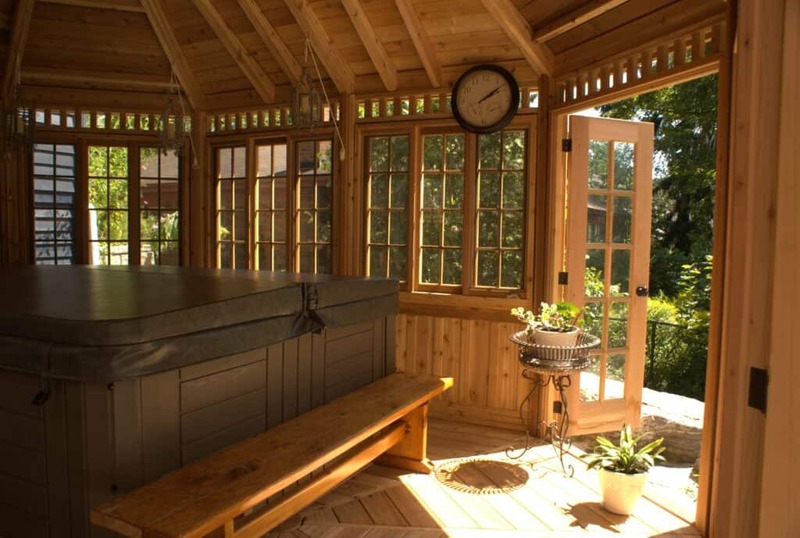 Coventry Spa Enclosures - This design features stunning leaded glass French doors and tilted windows, a high cedar shingled roof, elegantly cambered eaves, traditional brass hardware, and exquisite trim and detail all around. It is perfect is any setting and especially to be used as a hot tub enclosure – the windows and doors allow you to see the view from all angles. Bali Tea House Spa Enclosures – Inspired by traditional Japanese architecture, our Teahouse style spa enclosure is brilliant in its minimalism. Perfect as your hot tub enclosure to soak after a long day at the office, the Bali Tea House enclosure is sure to leave you feeling refreshed.